I was fortunate to spend two days at the Chinese University of Hong Kong (CUHK) which is located in Sha Tin, in the New Territories, and about 25 minutes drive from the Chinese Mainland. This is much prettier than ours!! 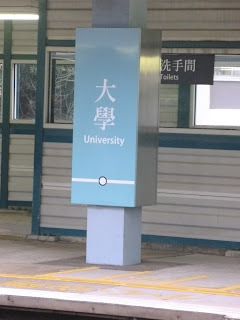 Like the University of Hong Kong, CUHK is built into a mountainside, but unlike HKU it is located over an extremely wide area. As a result the only real way to travel through the campus is to use one of the many shuttle busses that run throughout the day and into the evening from the very busy transport hub at the base of campus. At this hub, buses, mini buses and taxis await to transport visitors, students and staff to where ever they wish, either on campus or off. The campus is notionally split into 3, the upper level, the mid-level and the lower level. Just to try to put the size into context, this picture (below) shows the view down the mountain from the United Colleges at the top of campus, it also shows one of the fleet of pink buses that take students around campus from building to building and lecture to lecture throughout the day. Note the tall green building in the background right in the centre of the picture. This tall green building is in fact an Hyatt Hotel, built on university land, but working in partnership with the University to provide training for students in all areas of hospitality management. This building is actually located by the transport hub at the bottom of campus. The developments include an extension to the Main Library (the University has 7 libraries on campus) and the creation of 100 new classrooms to accommodate approximately 3,000 extra students. The University has an educational research unit, Centre for Learning Enhancement and Research (CLEAR) which identified that there was a need for evidenced based recommendations to guide the University and co-ordinate the developments and strategies regarding new generation learning environments. A number of papers were received by the University which shaped and influenced the decisions for developments in learning spaces, including the need to create many more smaller rooms which were flexible in their design and supported group interaction and the creation of a number of new Learning Commons for personal study. My first day at CUHK was spent with the Manager of the Audio Visual Services Unit. I had visited this unit in February very briefly with colleagues from HKU and felt that there was much more to see and learn. The Team is relatively small and currently reports into Registry Services and is separate and distinct to the University’s IT Service. It has staff who are able to provide comprehensive support to lectern PC’s and even has a full time Crestron Programmer, which is important as every room is Crestron controlled and managed through “RoomView”. The day started with chinese tea and a discussion about the facilities in lecture theatres and seminar rooms. This discussion was held in the unit’s presentation room which is used not only for meetings and general presentations, but can all be used for small group teaching. Almost all rooms are equipped as standard with data projection (single or dual), PC’s, DVD playback, visualisers, sound reinforcement and some form of writing board. Interestingly though, one or two OHP’s still exist and find their way into some of the rooms!! Echo360 is the lecture capture system here, Echo have an office in Hong Kong, which makes support much easier to manage. We then left to go on the campus tour, via the unit van (other vehicles used are motor scooters), and on the way to the car, we saw the porters starting to get the exam desks ready for use…. The first stop on the tour was the law building, where a new Moot court has been built, providing a sophisticated facility for teaching and mooting. Court simulations with a full audience can be undertaken here managed by staff on the room, or by a technician in the control room. The room has been set up with 5 cameras to give everyone in the room a view of proceedings.. In the technician’s control room, there is a Sony Anycast unit so that any class can be recorded, edited live and a DVD given to the lecturer for uploading to the iVLE. All of the active participants in the court have access to a radio microphone which are independently switched, with no need for intervention by the technician. On the judges bench is a motorized screen on which he/she can not only watch what is happening elsewhere in the room, but can also receive messages from the “lawyers” which cannot be seen by the audience or the opposing teams. 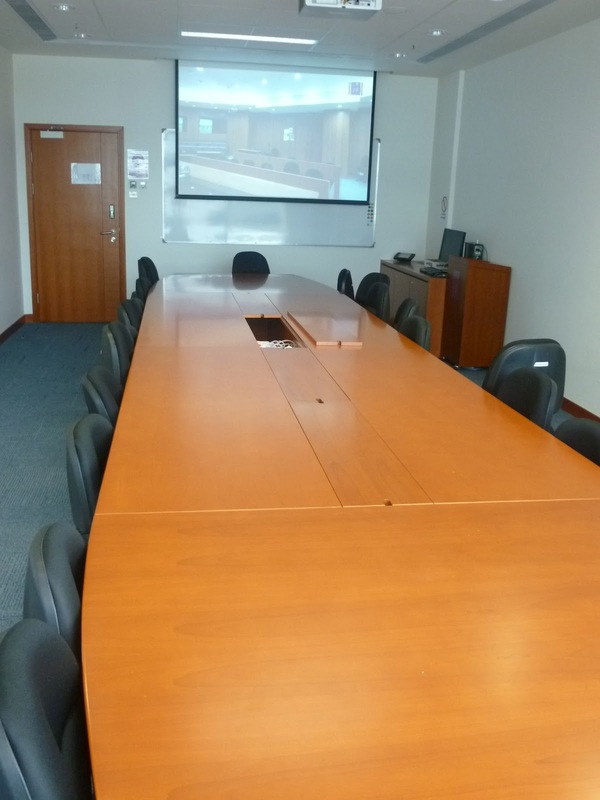 The events in the moot court can also be relayed to a suite of rooms along the corridor and even into foyer spaces when a special event is being held that the college wants to share with a wider audience. CUHK have had a suite of Active Learning Classrooms for some time (2-3 years). The pages on the crestron system have been designed by the Audio Visual Services unit programmer, and as a result they have been able to create something simple and intuitive, and which the academic staff are happy to use. When the two rooms are used as one, the control system allows one room to have control of all AV facilities, and the other acts as a slave. These rooms are going to be upgraded soon, and it is proposed that each group be given access to their own LCD panel for group work, and also for sharing. A number of language laboratories have been set up using three main layout designs. The final layout is much more conventional and appears to be the layout of choice for staff and students. Staff have said that this layout works well for both computer based working, but also the students can easily engage in group discussions over the screens without any difficulties. All of the rooms are exactly the same size, and each has the same capacity, but the "S" shaped room was the least efficient, giving a crowded real to the room, the layout with the round tables gave the impression of a lot more space being available in the room. Teachers are able to get the students to come together as a group in the open central space. The screens are simply lifted into place and a small catch locks them into place. all these rooms are supported by a member of the Audio Visual Services Unit. Finally, on the tour we went to look at a small recording studio co-located with the language laboratories and managed by the same technician. This small studio is available for staff and students. Staff are able to record lectures and other course based materials, and can manage the recording independently, or have the support of the technician. We finished the day with a walk around the gardens at the lower level of campus, with pergolas, koi carp and orchids, delightful! Glad you like it, I have now landed at Hong Kong University for the next 3 years!